Discussion in 'Designers and Collections' started by MagFan, Mar 8, 2009. So faar dont like any of it. Last two seasons i was more in to it. I don´t like it so far. Love the shoulders and colors!! 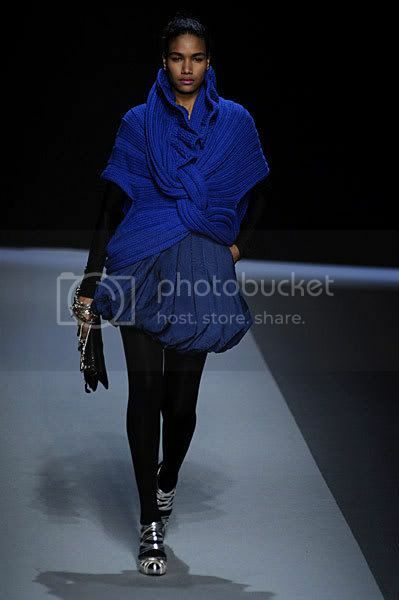 Really like the look with the blue sweater, scarf and tights and the grey skirt. Also love the blue knitted jacket. 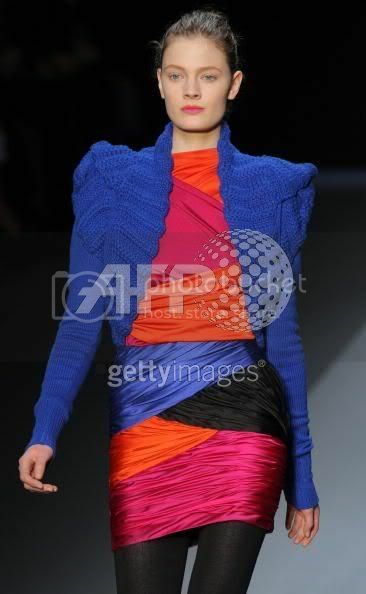 I know ungaro used to be about bright and sharp colours, but I really think that Cortazar should just stop trying to be, or referencing to dundas, valli, or even vincent past works.... His fall 08 and resort 09's really amazing to me with the soft palette and prints. Learn from Facchinetti. Though she ended up leaving pathetically, at least she made impressions. Wow, it's up on catwalking if anyone wants to see it. I'm truly disappointed at how unoriginal/ugly it is. Last season blew me away and this one just left me going WTF! Some of the black/grey pieces were nice, and I like this blue look, but that was about it. I didn't like the color choices at all. And this is Ungaro? Cortázar, please, go home.